Take these tax credits into consideration when you’re planning your new modular home and earn thousands of dollars in tax deductions! This article is part of our Definitive Guide to Building Modular. Building a new home can be expensive, even if you’re using modular construction. By making sure you get all the tax credits you qualify for, you can lessen your financial burden. Take these tax credits into consideration when you’re planning your home and setting your budget. If you use a solar panel energy system in your home, you can write off up to 30% of the cost of the system as long as it’s completed before January 1st, 2017. The credit applies to both the cost of the system and insulation costs. There is no limit to the amount of money that can be deducted in this way. If you use a solar water heater system in your home, you can write off up to 30% of the cost of the system as long as it’s completed before January 1st, 2017. 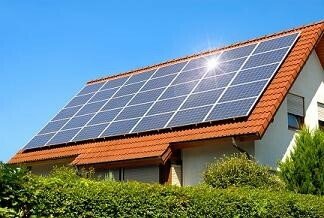 To qualify, at least half of the energy generated by the home must come from the sun. The system must also be certified by the Solar Rating and Certification Corporation or a government endorsed entity. This applies also applies to solar water heaters as long as you use the hot water for your home and not for a pool or hot tub. There is no limit to the amount of money that can be deducted in this way. Small residential wind turbines also receive a 30% write off with no upper limit. In order to qualify, the system must have a nameplate capacity of no more than 100 kilowatts. 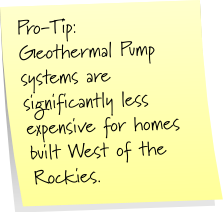 A new homeowner can write off 30% of the cost a geothermal heat pump and the installation costs, which is good because these systems can get pretty pricy. To qualify, you must use an Energy Star approved pump. 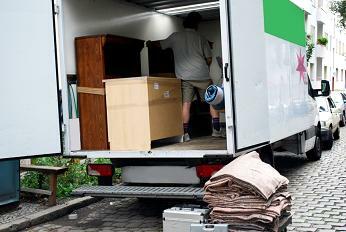 Writing off your moving expenses can save you way more than you might think. The average cost of moving even the contents of a small apartment cross-country is well over $10,000! If you own a lot of junk (or furniture), or if you’re moving a long distance, this one’s a biggie. You can write off 100% of your moving expenses as long as the new home you’re building is at least 50 miles closer to your place of work than your old home was. Moving can be extremely expensive, but absolutely everything from truck rental to moving services, to the gas and mileage on the car you used to move can be deducted from your taxes. Your property taxes are entirely tax-deductible. That one’s easy. If you took out a mortgage to build your modular home, you’ll be making interest payments every month along with paying off the principal of the loan. Provided that your total loan equals less than $1 million of debt, all of that interest is tax-deductible . If the loan is for over $1 million, only the interest paid on $1 million is deductible. You may also deduct interest payments made during the construction loan phase of your modular home mortgage as long as it doesn’t last more than 24 months. If you’ve chosen to pay off any points on your modular home mortgage, you can write off the entirety of the amount paid. You must use the tax deduction in the year that you paid, but you get to write it off all at once, and you can use this tax deduction even after the first year. If the mortgage is for a refinanced modular home, you may still deduct the price of the points, but you must do so over the remaining life of the loan.